While we’re still not out of drought danger in Texas, the extra spring rain has helped a bit. In some locations, lakes are full and Stage 3 restrictions have been eased. The continual rain has meant there has been no need to turn on our sprinkler systems. In fact, all this rain has actually started to cause some problems for our plants. While we’ll never complain about getting rain in Texas, it’s good to know how too much rain can affect our landscapes. Healthy, bioactive soil grows strong, beautiful lawns. An important part of healthy soil is oxygen. Just like we need air to survive, so do plant roots. The continual heavy rain is pushing oxygen out of the soil, potentially creating anaerobic conditions. Anaerobic conditions mean your plant’s roots will begin to suffocate and root rot diseases can take hold of them. Lawn areas can die out in soggy soil; landscape plants may also succumb to fungal diseases; trees can even fall if over-saturated soil heaves. The consistent heavy rain is also leaching important nutrients, such as Nitrogen, out of our soils. You may begin to notice new leaf growth in your lawn and landscape plants turning yellow or very pale green. Chlorosis, a lack of Nitrogen and Iron, can occur during times of extreme drought or extreme rainfall. Because the extra rainfall is encouraging plants to grow at a faster rate, the lack of nutrients available in the soil becomes an even bigger challenge. Lawns that have been growing in too much shade and compacted soils will be especially susceptible to water-related problems. Aeration is the best way to introduce oxygen back into your over-saturated soils. Core aeration pulls small plugs of soil out of the lawn, allowing air to re-enter the soil. 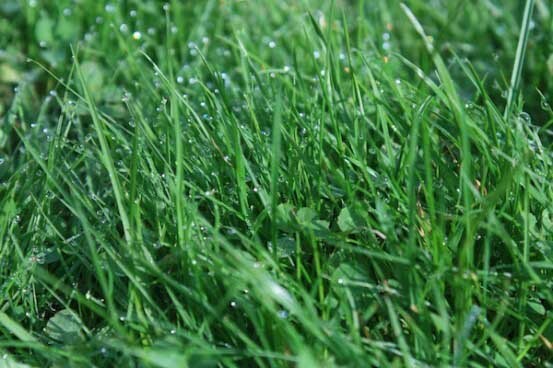 It also introduces beneficial bacteria to the thatch layer of the lawn and aids drainage. However, if your lawn is super-soggy, aeration equipment may do unintended damage. As soon as there is a break in the rain and the lawn isn’t soggy, core aeration should be performed. Since the heavy rain is leaching nutrients from the soil, fertilization and soil improvement will also be important. Landscape bed drainage can be improved with the addition of compost and expanded shale; lawns can benefit from core aeration and soil stimulators. If you're on our Soil Building program, your lawn will be fed this month with a boost of enzymatic cold-processed liquid fish, bio-stimulants, worm castings and micronutrients to improve soil health. Call us to get on the schedule for core aeration as soon as the rain clears a bit.